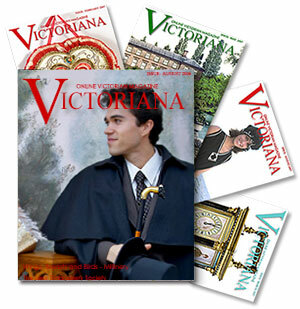 For Morning Dress in the early 19th century, blue coats are popular and sometimes worn with scarlet waistcoats. A dark green superfine cloth great coat with the ends of the collar in the front cut into a heart. A blue under coat is visible in the front with fawn colored pantaloons and half boots. Morning coats are cut light in the skirts and rather shorter than the evening coats; but both come up tolerably high in the neck, and fall rather low and open in front. This light green single breasted coat is cut off in the front with covered or plated buttons and collars of the same cloth. 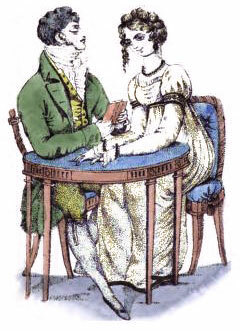 The waistcoat is of printed quilting made single breasted of dark brown or olive stripes. 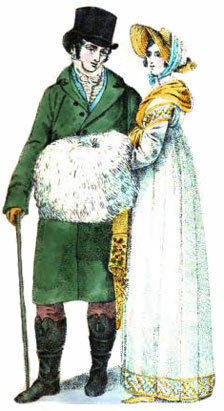 Light drab kerseymere or stocking pantaloons are worn with Hessian boots. Coats are often greenish olive or mixtures with plain plated buttons, collars of the same cloth and made without pocket flaps. Waistcoats of clear distinct stripes, bound with silk binding are worn with drab kerseymere breeches to come down over the knee with gilt buttons and brown top boots. Gentlemen's Evening Coats consist chiefly of the dark blues, with velvet collars and gilt buttons; or forest greens with either gilt buttons or covered with the same cloth, and are esteemed most fashionable with a black velvet collar. White Marseilles quilting waistcoats, single breasted, are worn with light drab kerseymere breeches with silk strings. 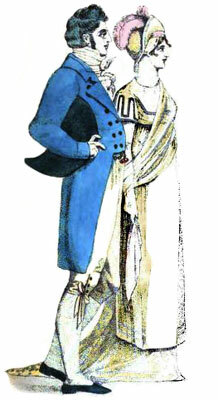 Evening Full Dress for gentlemen consists of a blue coat, lapelled, flat gilt buttons, and a black velvet collar. They generally have the two or three bottom buttons buttoned. 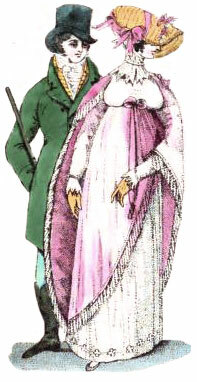 Waistcoats of fine white Marseilles quilting, single breasted are worn with drab kerseymere breeches that have silk strings at the knee. Accessories incude snow white narrow ribbed silk stockings with shoes in strings. Early 1800s fashions were not only elegant and pleasing to the eye, but were very comfortable. Fashionable attire for a stroll in Kensington Gardens from La Belle Assemblee.